We are excited to announce that in addition to carrying Rebecca Schoneveld, we are going to be hosting a Rebecca Schoneveld Trunk Show in February! February 21-24 we will have even more lovelies from our favorite Made in Brooklyn brand! Rebecca Schoneveld gowns are available in fully customizable options in a size range of 0-30! A few years back I bought a book (a lot actually, but one pertains most to this post): Adornments by Myra Callan! Adornments was so beautiful. Elizabeth Messina’s pictures pulled at the heart strings while Myra’s descriptions and hand at design made one feel that all was possible! You too could quit the world and be an artist…. Not shortly after reading her book (pouring over it most likely), I did just that. I helped design the bulk of a Designer’s collection for New York Fashion Week, saw my little business Gee June start thriving, and then it was time to quit the day job and commit. Of course it was hard, it was back breaking, but Gee June grew to Gee June Bridal and Gee June Bridal transcends service: It is to be a Bridal Boutique, with walls and windows, store hours, racks and shelves to be filled with product. Twigs and Honey product, by Myra Callan, included! This past week we collaborated with Allison Marie Photography on a plethora of styled shoots with models Jory and Hannah at Ludlowville Falls! Here are some sneak peeks of one our works: Beautiful Ruins! Jenny Yoo Collection Coming Soon to Gee June Bridal! We are happy to announce that we are bringing Jenny Yoo Collection, Jenny by Jenny Yoo, Jenny Yoo Bridesmaids, and Jenny Yoo Flower Girl to Gee June Bridal in September!!! Rebecca Schoneveld: Handcrafted in Brooklyn! Special Announcement! Coming to Ithaca from Brooklyn: Rebecca Schoneveld! I'm so excited for this as Rebecca Schoneveld is the only Designer, outside of big-box retailers, to offer gowns in a customizable size range from 0-30! Scroll below for a sneak peek of some styles we are bringing in! It is with great pleasure that I announce, byway of London, via New York: Gee June Bridal will carry Catherine Deane gowns and bridal separates at our boutique, in Press Bay Court of Downtown Ithaca, off The Commons, when we open! To celebrate we have posted pictures of Miss. Jeneva, one of our favorite gowns! Jeneva will be available in store! Part I of our June of Ithaca, private label collection saw us at Ithaca Falls! For Part II we went to Buttermilk Falls! Model, Hannah Garrett models our Lexi Tank and Charlie Skirt! This look is easy and transitional! It can be your wedding look, bachelorette, bridal shower, or be packed in your Honeymoon trousseau! Lexi Tank and Lettuce Edged Charlie Skirt: Gee June Bridal! Earth Mother: Spring has Come! On Saturday, Spring finally came and we think stayed! To celebrate good weather and the ability to be outside we did a shoot with Allison Marie Photography and Aletta, our model at Lime Hollow! In this shoot we debuted our Goldie Tiered Skirt and metallic Hawn Topper! It was important that we use 'colors of the sun' to show our appreciation for the warm breeze. Aletta's flower crown was made fresh by Lilybug Florist and hung to dry by us! The flowers she holds were leftover from my thank you bouquet, given to me by Allison and Summer from the DIA, after last week's fashion show! Ithaca Fashion Week's Downtown Fashion Show was held at the Dewitt Mall, home to the Ithaca Carshare and Bikeshare! Part of Ithaca Bikeshare is the Tompkins Bike Walk! Tompkins Bike Walk contributed this vintage bike to the runway show that Ithaca Flower Shop decked out in a spray! Damita Chamberlain, one of our model's stepped outside the mall, an old high school, with IFW's Downtown Style Stage Manager: Heather Skye! Heather, of course brought her camera and snapped some behind the scenes pics of Damita dresed as a Bride, with her bike in c/something blue, and wedding flowers!!! Attire: Gee June Bridal Seperates! 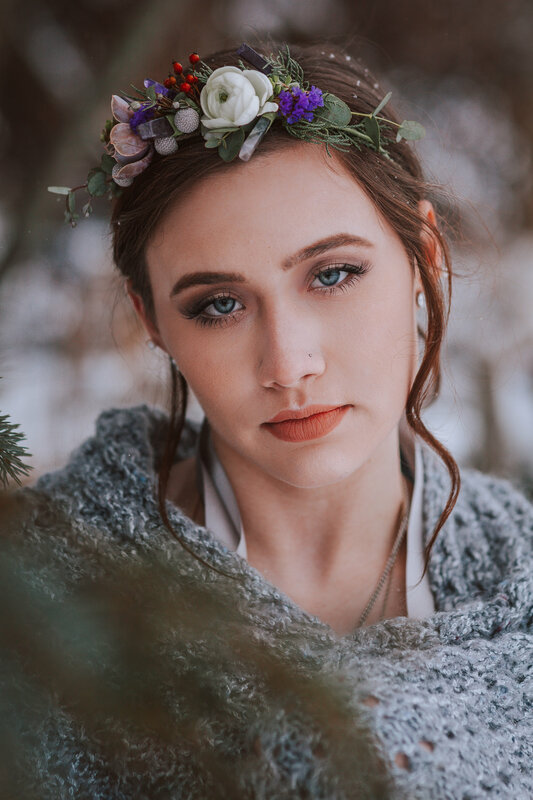 In this shoot with Heather Skye Photography, model and MUA Amy Chevallard is wearing a flower crown made by Blossom Schmidt of Plenty of Posies! We love the strong greenery mixed with the amethyst! Plenty of Posies is located at The Ithaca Farmer's Market! Their farm and flower fields are in Newfield, NY. This Winter shoot took place at their farm, under their arch!